DEVASTATION: Liberal candidate for MacKillop Nick McBride examines the destruction caused in Sherwood following the catastrophic bushfire on Saturday. Mr McBride slammed the State Government after the failure of the Alert SA app over the weekend. 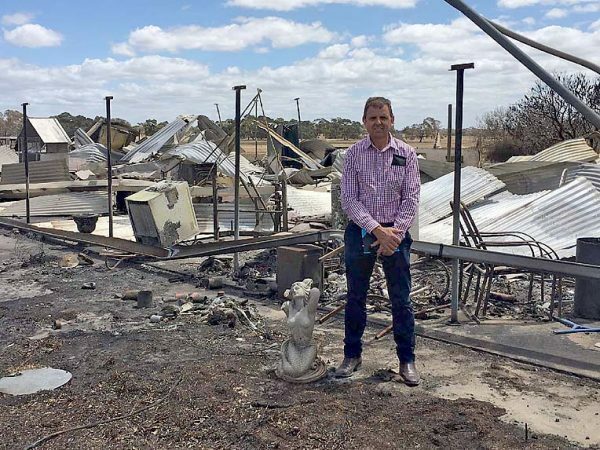 LIBERAL candidate for MacKillop Nick McBride has slammed the State Government’s emergency alert smartphone app after failing during a serious fire near Keith last weekend. The Alert SA app, which has been downloaded more than 170,000 times, failed to provide updates on Saturday as a catastrophic bushfire raged through the Sherwood area.